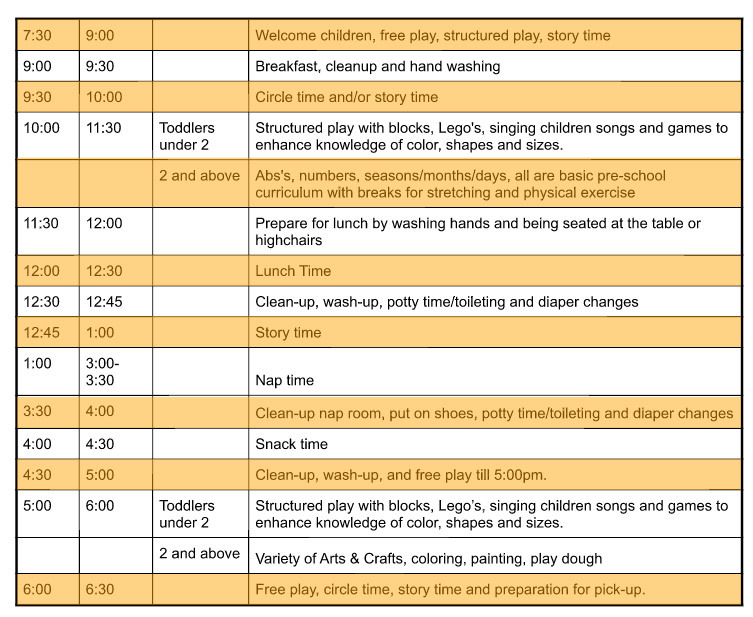 Our days are structured as listed below, keeping in mind actual times and activities are scheduled with flexibility taking into account the season, weather, and needs of the children. Our day starts at 7:30am and ends at 6:30pm. Infant's the day is augmented with singing, physical activity, sensory stimulation and lots of cuddling. Infant's follow their own natural routine for naps, feeding and diapering. Todler's under 2 years of age follow a typical daily schedule with flexibility built in. Daily activities might include block play, puzzles, circle time, songs, stories coloring and dramatic play. Our staff is free to change the schedule based upon the mood and/or needs of the child. Todler's 2 years and above are separated for educational activities. There is a selection of activities, which focus on letters numbers, time and coordination. During this time, the children take breaks for physical activity such as stretching, bending and other movements. Our Menu consists of a variety of basic American Meals with absolutely no pork products. All our groceries come from Costco and fruit and vegetables come from the neighborhood produce markets. All cooking is done on the premises and we serve hot, healthy meals daily. The below are just an idea of the type of foods we serve. Keeping in mind, we serve them with different side dishes as well as fresh fruit and vegetables daily.